This week’s BEACON Researchers at Work blog post is by MSU graduate student Emily Dolson. All biological organisms must occupy a single location in physical space. This idea is so obvious that most people don’t give it much thought, but it has important consequences. The spatial location of an organism controls what other organisms it can interact with. The sets of organisms can mate with each other, for instance, has a big impact on the way mutations can spread through a population. Similarly, the sets of organisms that compete with each other is a fundamental component of the selection pressures that they experience. If you consider other types of interactions, such as parasitism, mutualism, and predation, the implications of spatial structure only continue to grow. As an undergrad, I did a project on the spatial distribution of biodiversity in a forest. We didn’t end up having enough data to draw many conclusions, but I learned a lot about statistical techniques for describing spatial structure. More importantly, I learned that these techniques fascinate me! But perhaps the most important thing that I learned from that project was that there were benefits to collaborations between computer scientists and ecologists. I was doing this project at the end of my sophomore year, the time when students at my college had to declare a major. And it just so happened that at this time, for the first time in many years, I was unsure what field I wanted to go into. Since high school, I had been sure that I wanted to be a quantitative ecologist. But during the first two years of college, I had taken some computer science classes and fallen in love with them. Double-majoring happened to fit fairly neatly into my schedule, but I worried about how I was going to choose one field over the other when it came time to apply to grad school. Through the collaborations that it encouraged, the spatial biodiversity project allayed these fears. It gave me an opportunity to apply my skills from both fields and get advice from professors in both departments. Suddenly, I not only felt that I didn’t have to choose between fields, I felt that I could do more for science as a whole if I wasn’t forced to. Fast-forward a few years and now I’m a second year PhD student in the Ofria lab, pursuing a dual degree in Computer Science & Engineering and Ecology, Evolutionary Biology, & Behavior. I’m working on a number of projects, but the ones that are perhaps nearest and dearest to me are surprisingly similar to my undergrad project; they, too, deal with spatial structure and diversity. The biggest difference is that now I’m studying these phenomena in the context of evolution. I like studying the process of evolution in as general a case as possible, because it means I can do work that simultaneously has implications for both evolutionary computation and biological evolution. The other big difference between my work now and my work as an undergrad is that now I do most of my research in computational systems. The system I most commonly use is the Avida Digital Evolution Platform. Basically, Avida consists of a grid of virtual CPUs running self-replicating sequences of assembly code (Avidians). Any new organisms generated over the maximum population size overwrite pre-existing organisms, resulting in pressure to replicate quickly. Because the instruction that Avidians use to copy their genomes has the potential to introduce mutations, evolution occurs. Of course, Avidians do not actually exist in physical space. For the sake of answering questions about spatial dynamics, however, we choose to treat the grid as if it represents their spatial proximity to each other. This is a neat and intuitive way of achieving a gradient of interactions between organisms. Having such a gradient is useful both because it has theoretically interesting properties and because these properties are also present in natural systems as a result of them existing in physical space. 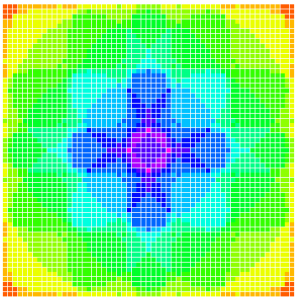 This image shows an environment containing 16 evenly spaced circular patches of 8 different resources. 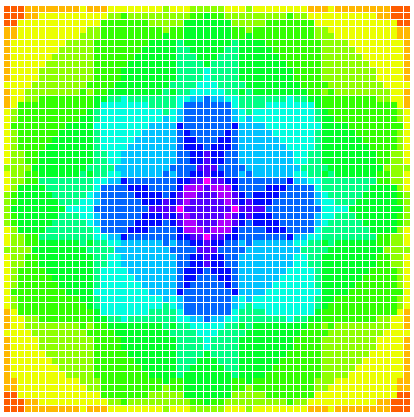 Cooler colors represent locations in the grid where a greater number of resources are rewarded. As you can see, this one environment contains an intricate variety of spatial niches. So far, the primary spatial project that I’ve been working on is one that I started for the BEACON spring course last semester, with Samuel Perez and Audra Chaput. Ecologists have long debated the reason that we see so many different species in ecosystems that don’t seem to have very many different niches (i.e. potential roles for a species within in an ecosystem). It turns out that there are a lot of reasons that this occurs, but one that is particularly commonly suggested and yet uncommonly tested is the idea that spatial heterogeneity allows an ecosystem to support more species. Spatial heterogeneity is the idea that most ecosystems have areas within them that are different from each other. For instance, while an ecosystem as a whole might have two resources present in relatively equal amounts, there might be pockets within that ecosystem in which one of these resources is much more common than the other. This has the potential to create many additional niches. Since even quantifying spatial heterogeneity in nature is challenging, exploring its implications in Avida makes a lot of sense. In Avida, we are able to set up patches of different resources and overlap them in different ways, creating a wide variety of niches (see image above). We can then explore the way that diversity changes over time across this spatial environment, in comparison with more or less heterogeneous environments. Because spatial strategies could be used to maintain a diversity of solutions in evolutionary computation, this work has practical implications for ecology, evolutionary biology, and evolutionary computation. A number of other BEACONites are also doing interesting work on spatial evolutionary dynamics, and I am fascinated to see where it leads. 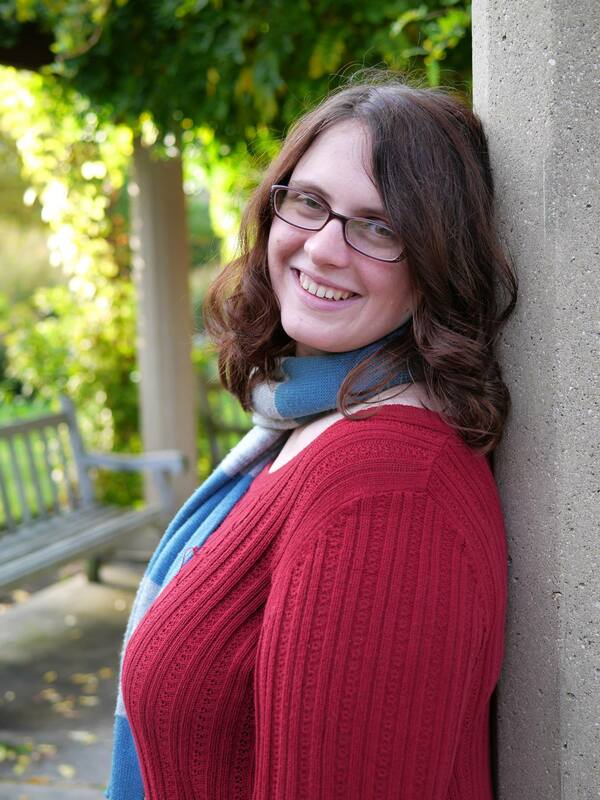 For more information about Emily’s work, you can contact her at dolsonem at msu dot edu. This entry was posted in BEACON Researchers at Work and tagged Avida, BEACON Researchers at Work, biodiversity, Biological Evolution, Digital Evolution, ecosystems, spatial relationships. Bookmark the permalink.